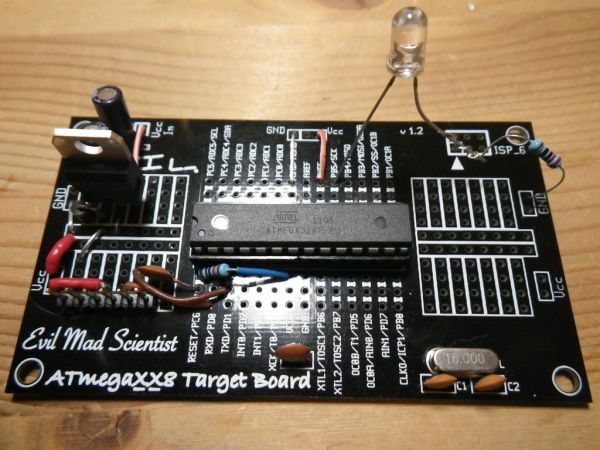 I have been making my own Arduino’s on strip-board but recently bought some of the Evil Mad Scientist ATmegaxx8 Target Boards. 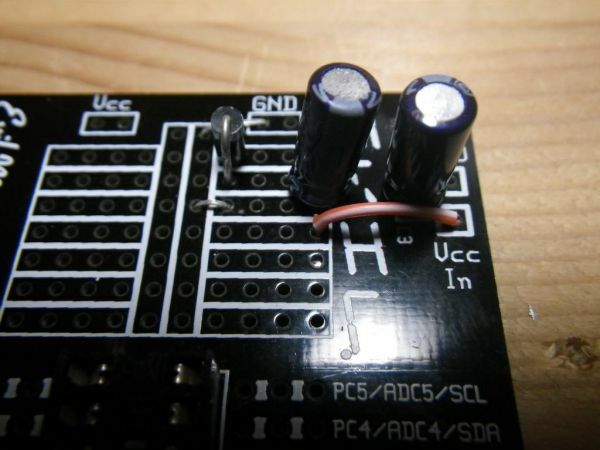 In this Instructable I am using 2 of the 4 prototype areas, one for the 5V regulator and one for the FTDI headers. If you are going to use a 5V supply like a wall wart then you won’t need the regulator and if you want to program the AVR chip in a regular Arduino and move it into this board then you won’t require the FTDI headers. Solder in the IC socket – I used 2x 14 pin sockets for this build. Alternatively you could use a 16MHz resonator instead of the crystal and without the capacitors. I am using the top left prototype space for the 5V regulator and caps as it is next to where the C3 is. There are 7 “buses” and I use the first 4. There are 2x 10uF electrolytic caps used for power smoothing – one goes across the LM7805 Vin and GND, the other goes across LM7805 Vout and ground. One goes on the prototype area, the other in C3.